No More Excuses For Failing In Collecting Commission Checks On-The-Fly! To Collect Missing Commission Checks! and Give-Away Rights in a High Demand Niche! When you watched the video overview of the software I know you will recognize the high quality of these software products. It isn't something that was created in 30 minutes by having added a few videos or text files and that was it. This is the first software of a huge e-learning series about all important internet marketing topics which will be launching within the next few months. It took me several months to optimize the monetization methods in a way that you'll be able to earn your first bucks in the shortest time, even if you've never earned a dime before - all while building a highly responsive list! In the video, you can see that each software (Volume 1 and Volume 2) contains 6 make money methods for a total of 46 multi-media videos. 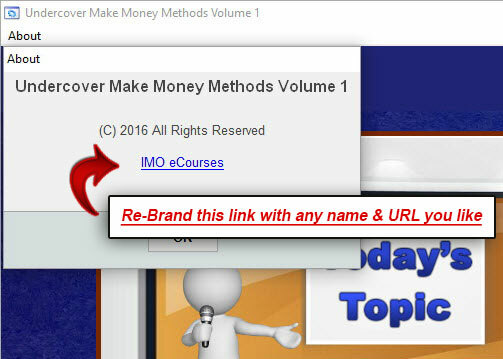 There's an additional make money method containing 12 chapters full of high-quality content. Not Only 1 but 2 Re-Brandable Software Products!!! Each of the 13 methods could easily be sold as a standalone software. I've added more than 20 different ways for you to monetize them! Just add your custom autoresponder code to the blank file. That's it. How easy is that? ...I even went one step further and created a 3rd set of 7 templates for you, which will allows you to add the download link to the red button which means your visitors can download the software without the need of filling out any form. But how do I get subscribers from offering the direct download link, you are asking...? That's a good question. With the option provided by this software, all one has to do is add a registration code requirement at the opening screen and you'll be able to collect your visitor's details on the backend, after they have downloaded the software. Let me show you how the opening screen will look like when you activated the registration form requirement. 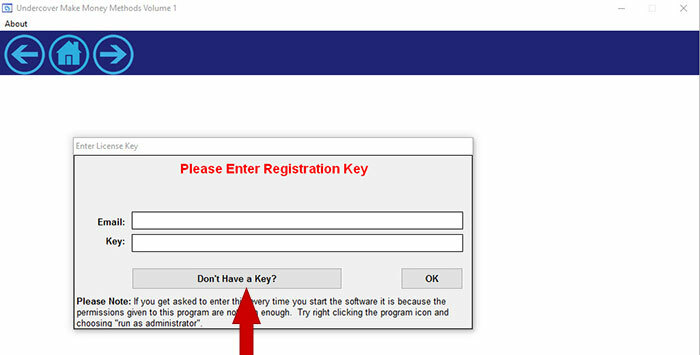 ...After activation of the registration feature, your customers will see this form when opening the downloaded software. Then they just need to click the "Don't have a key?" button which redirects them to your squeeze page for the registration code. ...and of course, I've created the registration code squeeze page in 7 different versions for you as well. Just add your custom autoresponder code, upload the squeeze page to your server and add this URL to the branding tool (more about the branding tool in a few seconds). be automatically redirected after 5 seconds! One doesn't need much to set up this additional commission funnel. I have already finished most of the work for you. You just have to choose the redirect page you prefer, add your link to the file, upload the file to a server and use the URL of that file in your autoresponder code as the "redirect to thank-you page". That's it! The special script of this template will then do it's magic on it's own. You'll be surprised with how many additional commissions will be coming in. It's a real commission booster feature which all smart email marketers are using right now! ...and again I'll make it super easy for you. You'll receive a similar copy of the salesletter you are just reading. I only removed the parts about the branding options since it won't be allowed to sell the branding tool and used different high-quality images that your offer will differ from the full package which includes the brander. All you have to do is, add your payment link to the order button, upload all salesletter files and start sending traffic to your new offer. That's all! ...and again I'll make it super easy for you. You just have to enter your own affiliate links for the free workshop and the banner at the bottom of the download page. Both offers are high converting ones offered by well-known marketers with payouts of $800+ commission. Then all you have to do is add your own download link of the software. That's all! Not only 1 but 2 re-brandable software products, more than 20 different ways for you to monetize them. This is the easiest way to actually build your list while collecting big commission checks! When you watch the overview video again at the top of this page you'll see that each software (volume 1 and 2) includes this button on the main page when opening the software. Option #1: Follow my suggestion and use your affiliate link for the product I am using myself with this button and which is closely related to the topic of the software. Earn 50% commissions on the front end and each additional product in the funnel. Option #2: Re-Brand this button and use any link you like i.e. for one of your own products, a different affiliate product or a landing page. Your imagination is the limit. Remember, each of the software will be displaying this button which means, you can monetize it in two different ways if you like! Each software (volume 1 and 2) has an "About" section at the top of the screen. You can brand both links with your own name and website URL or choose any other option i.e. an affiliate program for generating additional commissions. Remember, each software will be displaying this section which means, you can monetize it in two different ways if you like! Each software (volume 1 and 2) has a "Mystery Bonuses" section on the main page when opening the software which looks exactly like the image above. Option #1: You can add download links to some high-quality products to increase the value of this software. Option #2: You can add links to some other landing pages and start a long follow-up message series, resulting in higher conversion rates for your promotions. Option #3: You can use clickbanking partner links to generate your list even quicker. If you have no idea what clickbanking is...in short....it's like a traffic exchange to landing pages for list building. Hint: My limited time bonus tool #3 at the bottom of this page will allow you to handle this for you. Option #4: You can find JV partners and make agreements that you'll add their links to any of the bonuses buttons and the JV partner will be adding your link or banner to their thank-you pages or wherever they can send traffic to. There are surely tons of additional options for you to monetize these buttons. Your imagination is the limit. Remember, each software will display this section which means, you can monetize it in two different ways if you like! 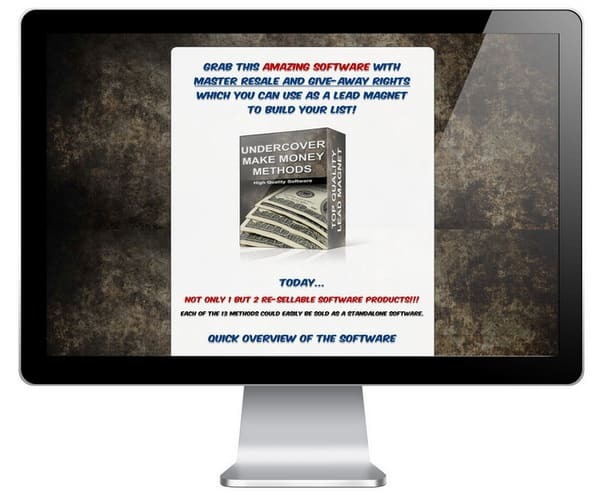 At the bottom of each software, you'll find an additional make money method containing 12 chapters of high-quality content. Each chapter displays 2 banners of a closely related multi-media product. You can re-brand all 24 banners with your affiliate link and earn 50% commissions on the front end product and 50% on all upsell products as well. Your subscriber's interest will surely be sky high when he's reading the button text and it makes him want to find out how he can even improve upon the methods shown in the videos. There's no doubt that most people WILL click that button. You can redirect your software users to any website you like, your own ones, an affiliate product, landing pages or websites from JV partners. It is totally up to you how to monetize those 12 buttons. When you start counting how many links you'll be able to brand, you can see that there are 11 ways of monetization. 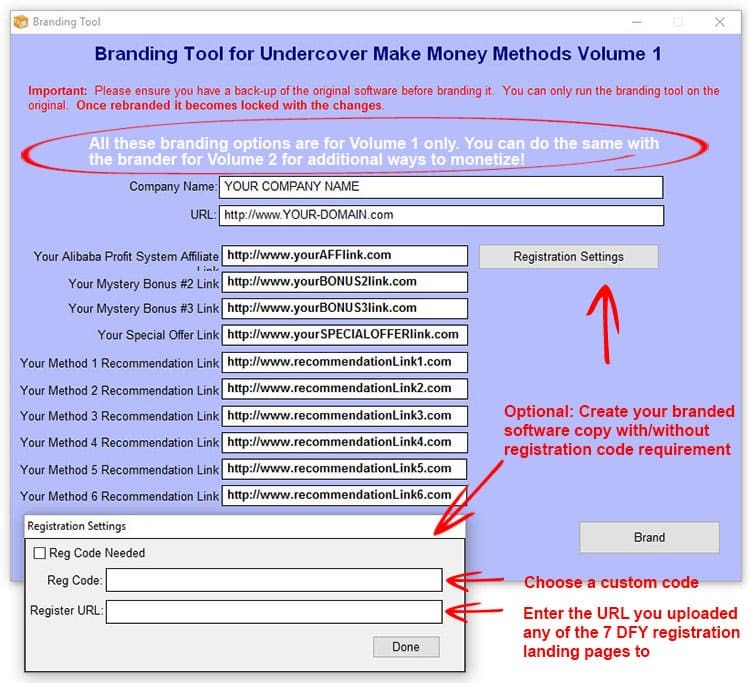 Remember for each Volume you'll get your own branding tool for a total of 22 ways of monetization. Next, you also can add your own name as the creator of the software and choose if you want, to force people to register, to unlock the software resulting in an exploding list. Feel free to play with this feature and decide which strategy brings in more subscribers, either with or without the requirement of a registration. When you store the original software files as a backup, always use a copy of them for branding purposes. You could create unlimited versions of this software - all redirecting to different locations. This could be an interesting strategy when doing JV partnerships, to reward them by adding one of their links to your software version in exchange for a task they do for you. In the idea section above, I already gave you tips on what else you can do by branding all 11 links. Advantage #2: You could offer volume #1 as a free gift and offer volume #2 as a gift when customers refer X number of people to your free gift page. There are tons of viral tools available which will handle this process for you. Check out my limited time bonus #1 at the bottom of this page. It will provide the tool for running this tactic. Advantage #3: You could offer volume #1 as a free gift and offer volume #2 as a winning prize when people join a contest. I am sure there are tens of additional advantages...these 3 examples should give you a initial ideas, about why splitting this software into 2 volumes was a smart move. How Much is this Complete Package Worth to You? Now, you might think the price I'm asking for the software is something you won't be able to afford...Imagine the work involved, if you'd have to create the software yourself. You could look forward to spending several weeks or even months working on it and still create NOTHING ELSE like I did - say GOODBYE to your family and social life. But you don't have to worry about that because I've already done all the hard work for you. That's the reason, why you surely can see the insane value in this package, even if I would sell it for $297+. I won't be asking that much for my commission generating and list building monster machines. Never! I want YOU to succeed and to be honest, I hope you'll be that thankful when you see the small one-time fee and you'll feel obligated to send me a real testimonial in the near future, about your success with my software...a testimonial which I can use for my future software. Because I plan to extend this series of e-learning tools. The price will be NOWHERE near to the figure quoted above, not even close. "Can I really afford to pass up this amazing offer?" When You Make The Wise Decision To Grab This Today, You'll Also Get These Fast Action Bonuses. I've packaged the following tools for helping you to handle the ideas, I've mentioned on this page, not being forced to buy another one or two products to do so. However I cannot guarantee that you'll see these bonuses tomorrow again, if you wait with your order. 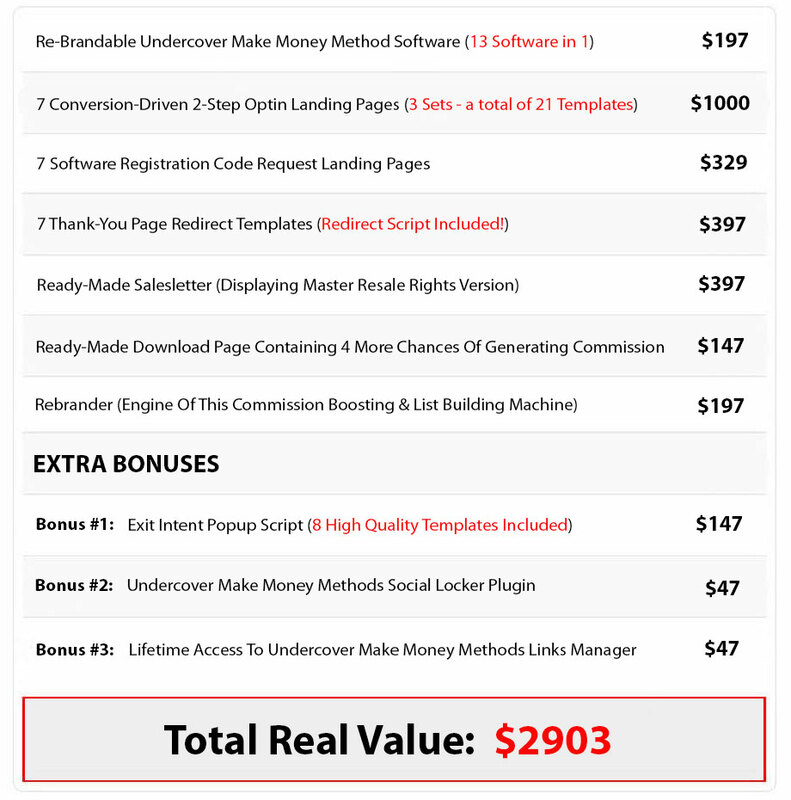 Do you remember the ideas I mentioned above how you can monetize this done-for-you package? 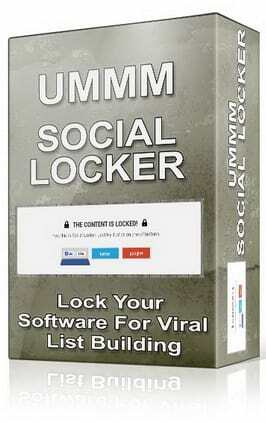 UMMM Social Locker is one of the tools which will allow you to run several of these tactics. UMMM Social Locker will allows you to lock a part of content on a web page (maybe the part where they can download Volume 2 of this software?) until a user clicks one of the social buttons (Facebook Like, Tweet Button, Google +1) and help you to get more likes/tweets/+1s, traffic and customers! You can add any URL to like, share, tweet or +1. You can easily set a URL for each social button or a common URL for the all social buttons. Several eye-catching preset styles and effects to bring variety to the table: you can take advantage of professional preset styles and effects that will enhance your visitor’s experience. You have also the chance to lock videos! This will dramatically increase your response as we all know that video is all the rage right now. 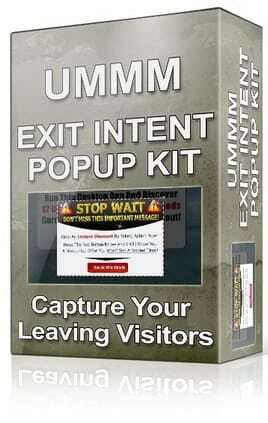 An exit intent popup is an HTML window that shows dynamically when a visitor goes to close your website. Visitor mouse movements are tracked, and when their cursor moves outside the upper page boundary, the popup is triggered. 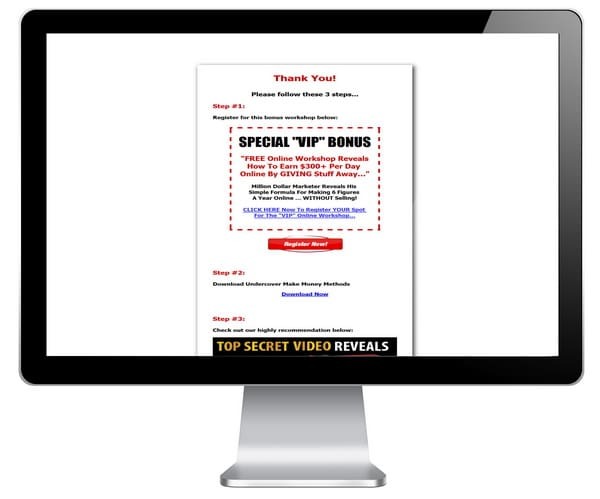 Use my UMMM Exit Intent Popup Kit to retain visitors that would otherwise be lost and lead them to a special offer, a bonus product or a landing page. This is the technique, only the smartest marketers use to monetize their lost traffic but most of them won't tell you about it. ...but that's not all. I've also created an additional set of 4 more popup templates you can use to lead your leaving visitors to any special offer you like. Do you remember the hint I gave at the top of this page about how you can manage the links best, you use for the brandable buttons? 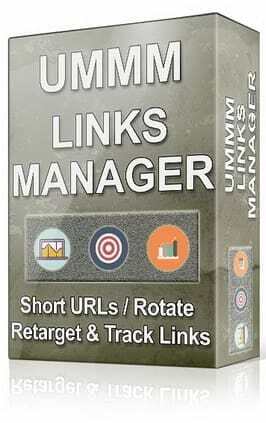 UMMM Links Manager is exactly the tool which allows you to manage every tactic which comes into your mind. [+] Short URL masking - choose your own custom short URL to use for your link tracking. You always can change the URL in the future when you find out that it isn't that profitable in your branded software. This way you don't need to rebrand and share the software again. Simply change the path to the URL and your customers won't recognize any changes. [+] Split testing - activate our split testing feature and you can distribute traffic to different destinations, testing the results. You can also use this feature to add several clickbanking partner's links to ONE link (bonus button, special offer button, helpful resourcesbutton etc.) for additional traffic to your landing page. This way it works like a rotator. [+] Retargeting - add your Facebook or other retargeting code to capture your audience before they go to the redirected URL. [+] Password protection - set up an optional password protection step to control who can access your link. Let me make you an offer you can't refuse. Try my software for a FULL 30 days. If you aren't happy, just send me a quick email and I will refund every penny you spent. There is absolutely no reason to delay, because I am taking all of the risk. There is no risk to you, so grab your copy right now! Click The Button Below Now To Lock-In a Huge Discount And Get INSTANT ACCESS. 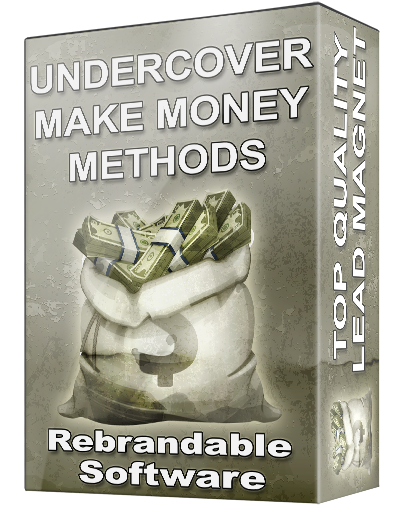 Thank you so much for taking the time to take a look at this extremely limited offer that has the potential to help you collect multiple commissions by simply giving away a branded copy of Undercover Make Money Methods! PS I've compiled some of the most frequently asked questions about the guide that will show you how to plan for success! This is a Windows software only, but if you have a Windows Emulator on your Mac, it should work fine. Do I need to be an expert to install this windows desktop app? Do you run an affiliate program for this software package? I'm getting a malware/virus warning in windows. Why is that? Your anti-virus program may not recognize the software and give you a virus warning. If so, it is a FALSE-POSITIVE, which is NO threat to your computer. The software contains a build-in functionality to "call-home" to verify the software registration The anti-virus program may be set to be suspicious of any new executable program it doesn't recognize. You can add this software to your exception list (allowed programs/whitelist) of your anti-virus program for sure. I assure you that I am not going to ruin my reputation and my business by selling programs with malicous code. You are absolutely SAFE. GUARANTEED!